This is a wooden rectangular tall glass display cabinet. The built in toe kick prevents damage from foot traffic. The locking door restricts access to only authorized personnel. The three adjustable shelves in this display cabinet are tempered glass. Adjustable shelves allow you to customize the display to your tastes. There is a 50 watt halogen light that comes standard with this case to better illuminate your products. Solid wood materials are used in the construction of this wooden rectangular tall glass display cabinet. This allows the display cabinet to be placed in high traffic areas without any worries. We also build custom wooden tall display cabinet if this design does not fit your requirements exactly. 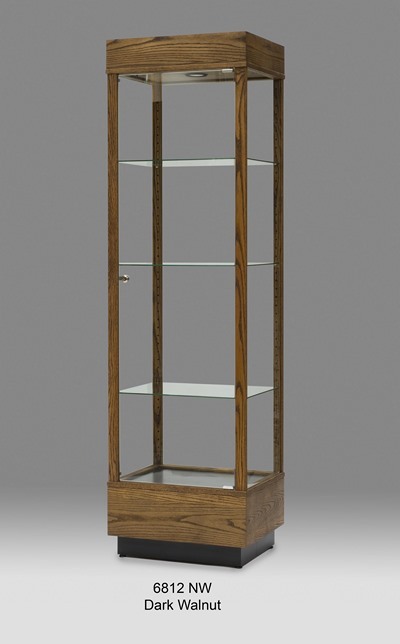 Click here to view the full line of custom finishes we have available for this wooden rectangular tall glass display cabinet.